From some of the most endangered to the rarest of animal species, you have it all here. White Royal Bengal Tiger is originally the result of cross of a white male crossbred tiger with a white carrier female Bengal tiger which further led the production of four white tiger cubs and one normal colored white carrier cub. Extremely beautiful and rare in nature, these white royal Bengal tigers make the center of attention in zoos in India and other parts of world. They are individual specimen and continue the inbreeding of parents to cubs. White Royal Bengal Tiger generally get fully grown within two to three years. 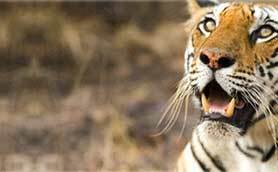 Male tigers weigh 200-230 kilograms and reach up to three meter in length while females one are 130-170 kilograms and their length is usually 2.5 meters. Their whole body is stripped like fingerprints. The unique feature is that any of the mark does not match with another one. And a white spot appeared on the back of their ears which is similar to eyes. 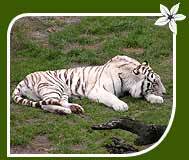 The habitat of white tiger depend on the availability of food. Usually, their sanctuary are 26-78 sq km. 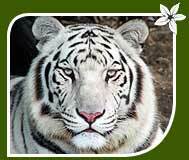 Reported that once there were white tigers in large number in some areas of Myanmar and the Javintia hills of Meghalaya. But due to sever shoot out, most of them were wiped off. Also said they were shoot out in Poona , Upper Assam, Orissa, Bilaspur and Cooch Bihar during 1892 and 1922. Most of them are captivated in the zoos and some are live freely in the grass lands and thick forests of wildlife sanctuaries. Mohan was the last white Bengal tiger caught by Maharajah Shri Martand Singh in 1951. The whole generation of the white Royal Bengal tiger came to be inbred by it. Mohan gave birth 114 white cubs, out of which 25 are survived in Indian zoos and abroad. 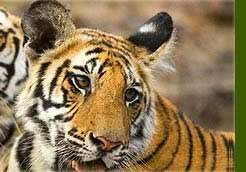 They can be seen in the Indian zoos and wildlife sanctuaries. 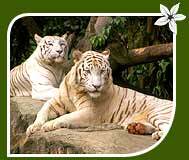 Travellers can visit the following national parks and zoos to enjoy the beautiful White royal Bengal tiger.